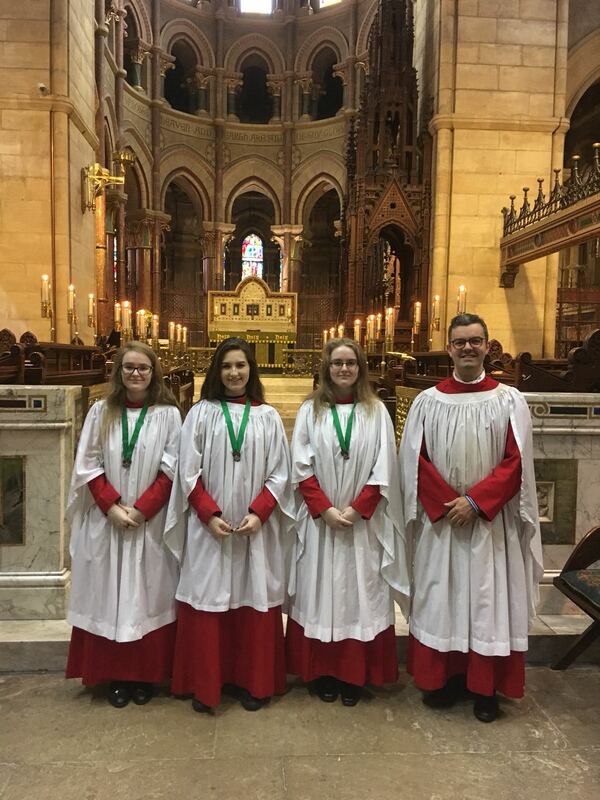 Three senior choristers of St Fin Barre’s Cathedral, Cork were presented with the Royal School of Church Music Bronze Award following the Eucharist at the Cathedral on Sunday 2nd September. The girls travelled to Dublin in June to be assessed on their singing and associated musical skills such as sight reading and aural tests. In addition they were required to give a short presentation on several aspects of church liturgy and how it links to the music which they sing. They all achieved the highest possible grade and this reflects the hard work which they put in to the examination and also the commitment and dedication which they have given to the cathedral choir over the years. Three choristers of St Fin Barre’s Cathedral Cork who recently received the RSCM bronze award with the Director of Music, Mr Peter Stobart. This entry was posted in Cathedral, Cathedral Choir, Church Music, People from the Diocese, Royal School of Church Music, Youth Work. Bookmark the permalink.